kromekat.com » New Eden – latest personal work. New Eden – latest personal work. This image, or at least one like it has been in my mind for literally years now. 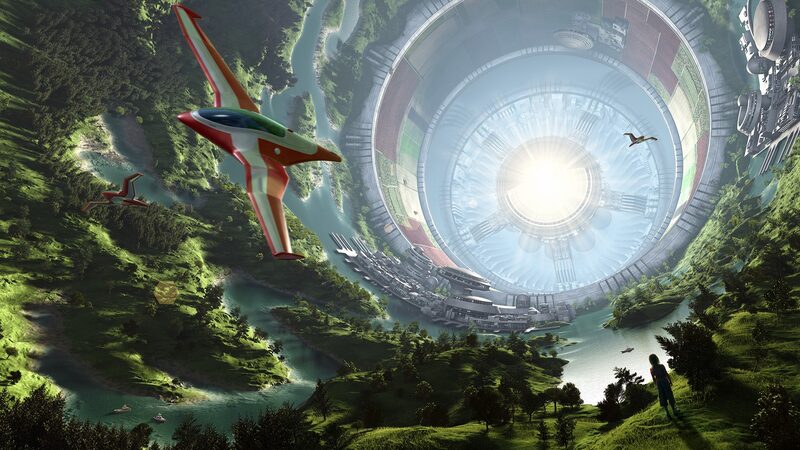 Probably inspired by a couple of NASA’s space colony concepts of the 70’s, definitely by Ben Bova’s novel ‘Colony’, and obviously to an extent by Greg Bear’s ‘Eon and Clarke’s ‘Rama’ series! At any rate, after getting the newest version of Cinema 4D, with render instances, and speeded up sub poly displacent, I did a couple of tests with large amounts of trees, and then started to put this idea to the test. I’ve been following your blog since January when I was first introduced to your art with your Classic Sci-Fi art tutorial using Cinema 4D and Vue in ImagineFX magazine. Your work is excellent and motivates me to improve my skills in digital artwork. I particularly like your figures and space art. Your latest space image is a stunning and expertly crafted update to the 1970’s images you mention as inspirations. There is a striking resemblance to this image of a Bernal sphere. You state that you used Cinema 4D. Did you also use Vue to create the landscape and atmospheric elements? I really like your stuff. I too was curious how you create the really nice organic textures in some of your infographic/scientific pieces. Is this within C4D, Vue? thanks for the info. I’m relatively new to 3d and I’ve been using modo for awhile which I noticed wasn’t compatible with Vue anyway. I’ve been aware of Bryce for a long time and never tried it, but I will. What I particularly like about the topography you’ve created in some of your science/infographic pieces is the sharpness. For informational purposes I think the effect is really clean and the colors are nice and saturated. Sometimes I think 3d landscapes are a little too photoreal, whether through the use of atmospherics or whatever.